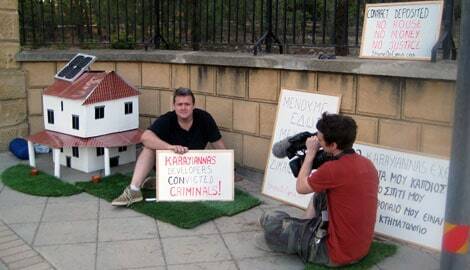 BRITISH national Conor O’Dwyer worked with the TV crew for two full days on Sunday and Monday as it documented the lengthy legal battle he has been involved in with a Paralimni-based developer since 2005. “The programme mainly focused on the fact that the contract to my property is currently in the Land Registry, my money is in the developer’s bank, while someone else is living in my house,” said O’Dwyer. His legal battle began five years ago after he signed a property deal with Karayiannas property developer in Frenaros for the cost of £163,000. O’Dwyer claims that after he purchased the house it was then resold without his knowledge by the developers. Additionally, he says that soon after he purchased the house, the developers went back on their promise that an empty lot to the side of his property would not be built on. The developer, however, argued in court that this was never stated in the contract and they had already committed to building another property. ITV also recorded O’Dwyer staging a one- man camping protest outside the Presidential Palace, which began on Monday and is set to and today, intended to highlight a criminal case being brought against him by the state for publishing his story online. O’Dwyer is set to appear before a Paralimni court as a defendant on November 23 accused of publishing slanderous video footage of his developers on his website. “The reason for this demonstration is to highlight what some Cypriot local developers are doing to foreign investors and how the state is letting them get away with it,” said O’Dwyer. Additionally, Attorney General Petros Clerides has filed an appeal against a court decision regarding the assault of O’Dwyer by his developers. Paralimni court recently sentenced 55-year old Christoforos Karayiannas and his son Marios, 35, to a 10-month suspended jail term for assaulting O’Dwyer in 2008. A third man was also found guilty of assault and was ordered to pay a €3,000 fine. The court found the men guilty of causing actual bodily harm (ABH) but Clerides has appealed for a more serious sentence of grievous bodily harm (GBH), which carries a maximum of seven years. During the trial, the court heard how the three men rammed into O’Dwyer’s car in Frenaros village and then beat him, resulting in him being hospitalised for a week. At last the A.G. has woken up! Or was it the sight of an ITV crew outside the Presidential Palace……? Perhaps the prospect of the A.G. having to explain his own behaviour in the O’Dwyer case proved too much and has now finally resulted in this sudden ‘U Turn’. Just maybe the A.G. will get off his backside & will do something about the BS case HE brought against O’Dwyer for telling the truth online! OR is this STILL asking too much…. THE LENGTHS O’DWYER HAS HAD TO GO TO OBTAIN HIS BASIC RIGHTS FOR JUSTICE WHEN HE BOUGHT WITHIN THE EU. ITS A DISGRACE – SHAME ON CYPRUS!!! Watch the inside out program on Monday 15th Nov @ 7.30 BBC West.The program involves Brits that have been robbed by a British builder who has used the Cypriot system to his advantage. This involves upwards of half a million Euro. Our consultant told us that the land opposite would be a green area. It was developed with villas. But now the site has been finished awhile and the greenery grown it looks good. Also we are not on top of each other. I sense another of these spurious libel cases; such as the failed attack on CPAG and this latest prosecution of Conor O’Dwyer. Watch out ITV and “Homes from Hell”! The Cypriot “system” may soon be coming after YOU. Can’t wait to see it, already have the popcorn and the lights dimmed. This is just the start of the inevitable EU assault on the Cypriot Legal and Governmental systems which continue to allow the totally unsafe Cypriot property market flourish and Developers to get away with fraud on a massive scale. Watch this space to see Fred Karno’s circus being dismantled. Bet they don’t show it in Cyprus!! !